Having a rock-solid resume is critical to landing your next job, but it doesn’t matter while using common sense along with some tips while creating an effective resume. Also, it’s an added challenge of attracting not only hiring managers but the software bots doing their upfront work crafting an exceptional resume these days. When combined with wording that will make its way past the software screens, everybody has a tip or two, and most are good. Although tips like confidence and how to answer questions you don’t know the answer to are good examples, sometimes you need more information than simple pointers. Moreover, in order to attain that extra edge, some say that it can be beneficial to polish your resume with professional. What are the Tips for Creating an Effective Resume Getting a Job? While creating an effective resume, it involves more than simply listing job experiences and education. As a professional, it must be a clear representation of you. From your skillset to career goals, it shows your interpersonal involvement as well. But, that’s a bad resume form when there are unnecessary add-ons like lengthy paragraphs, lists of irrelevant hobbies and interests or unclear section breaks. In addition, depending on your employment history and experience, there are different ways to format your resume. Also, the focus of your accomplishments will be on your academic performance if you’re a recent graduate. These will be highlighted when you’ll follow the right structure. 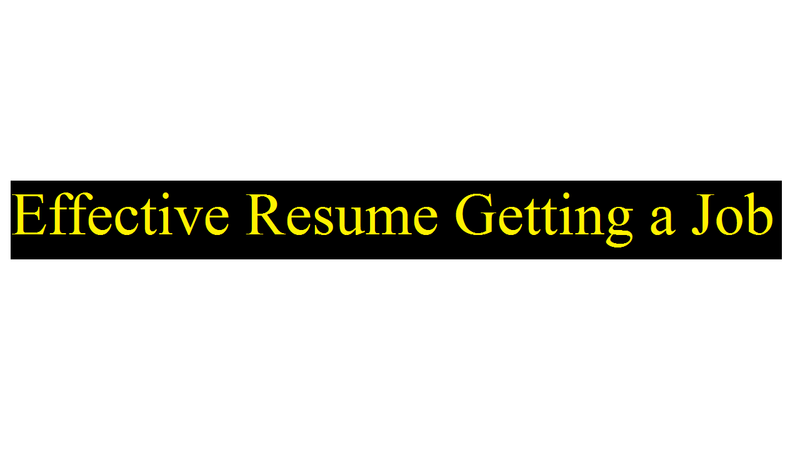 Besides, breaking from the traditional resume format can allow you to accentuate your skills and distract from the gaps when you have large gaps in your employment history. On the other hand, the employers and hiring managers don’t take the time to read through resumes in the initial round that’s well-known to all. Using their eyes glimpse, they scan the resumes. That’s why it should be easy to read and follow in order for your resume to not immediately end up in the rejected pile. And it’s worth to take time to properly organize your resume. But, don’t worry; we’re here to help you with some vital tips so that creating an effective resume would be easy and simple for you. It can be either easy or difficult to interpret and follow along while creating an effective resume. Also, it’ll only strain the hiring manager’s eyes if you use a tiny font to cram your information on one page and an extra-large font isn’t appropriate as well. The most appropriate font size for a resume 10-12 pt and Helvetica or Arial could be the standard font. But, keep in mind that you should not mix different fonts in a resume. Also, keep avoiding putting space between sections to clearly delineate them. Moreover, make use of bullet points to list qualifications and accomplishments in lieu of writing paragraphs for conciseness and clarity. It’ll be easy to define if you put your contact information at the top. And avoid making employers have to hunt around for a way to contact you when your contact somewhere else. Also, if it’s applicable then include your name, address, phone numbers, email address, and website etc. You should also include any social media accounts you’d like employers to see depending on the role you’re applying for. From a career identity to authenticity, passion, essence, an image, a branding resume comes with many more things. Integrate a distinctive appearance for a branded resume. But, when you’re putting these all, don’t forget to add your contact information on the top. Under the “Work Experience” section, list your job title, company, and dates of employment. With your most recent job at the top, list them in reverse-chronological order. In order to highlight accomplishments and responsibilities for each job – paragraphs, use bullet points underneath instead of paragraphs. This is because paragraphs take longer to read and tend to use extra words that make the relevant information hard to find. As the employers like it, you’ll find bullet points keep things simple and easy-to-read. Moreover, avoid listing any unwanted or lies in your resume. It’s wise to select the resume format whether it’ll be chronological, functional or combined. Being appropriate for those with a steady employment history, the chronological format is the traditional format. With the most current information is listed foremost, this format gives a reverse-chronological list of your work history. But, a functional format may be more effective if there is a large gap in their employment history. In this case, it focuses on your achievements and experiences and taking it off the gaps listing your skills instead of dates of employment. And those who are changing careers, this format are recommended for them. As a summary of your work experience, it’s easy to think of your resume. However, keep in mind that it’s not just about listing your professional history. Instead, it’s a strategic tool for marketing your individual brand. Also, consider following the recruiter’s perspective because the recruiter is seeking a candidate who fits a job description and can bring value to an organization. As they don’t have time to delve into your resume and figure out who you are, you need to connect the dots for them. So, think strategically when you make a résumé. When they first look at a resume every recruiter is looking for specific keywords. In particular, although this initial review might not even be done by a recruiter, rather by a computer program. And in the first round of the hiring process, resumes are rarely viewed by human eyes. So, your application could get eliminated before it even reaches human resources without them. For example, if you’ve graduated recently then your educational background should come under “Contact Information”. But, you should list your education at the bottom if you already have several years of work experience under your belt.